Safe, easy access to roof spaces can be gained using rooflights adapted for the purpose. Access hatch rooflights feature internal opening mechanisms and hinged glazing frames, allowing the units to open to a minimum of typically around 80 degrees allowing unhindered roof access. When in the open position, the glazing frames are typically supported by telescopic or gas struts. Access hatch rooflights are available in a range of sizes and materials, starting at a minimum size of 900mm square. They can be specified for roof maintenance and other utility purposes or to open up roof spaces for terraces or roof gardens. 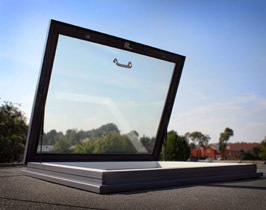 NARM member companies offer a wide variety of access hatch rooflights.